Okay! Seren and friends are through the breach in the city wall and outside so it should only be a matter of…oh. Yeah. Looks like that army outside isn’t in the best shape either. What with the not-normal colored fire everywhere, demons, and then even bigger demons that breathe the not-normal fire! At least Seren seems to be coping with her minor injury somewhat well? In news related things, there will NOT be a new page next week, July 24th. It’s a bit chaotic around here and we need the week to get a little further ahead on these pages. 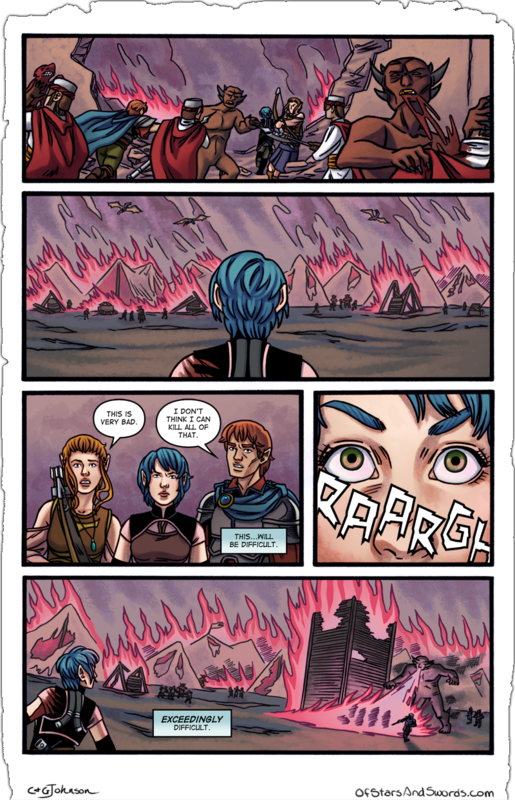 There WILL be an update to Cato’s story on the Prose site, instead, and the comic will be back on July 31st! There’s also now a button on our sidebar to take you to the Of Stars and Swords Comixology page! Currently, only Issue 0 is for sale through Comixology, but more are in the pipeline and we’ll keep you updated on that. There’s some extra art and bits in that version of the comic, and I’m open to suggestions if there’s things like process or what have you that you’d like to see in our backmatter for the books, so please feel free to e-mail/tweet/yell very loudly at me with suggestions! For those of you that would prefer a DRM-free digital version of the comic, I’m working on setting up a separate store page just for that! That shouldn’t take too long, and, of course, information will be right here when it’s live!